The ocean monuments from the Release 1.8 Minecraft update introduce 4 new blocks (prismarine, prismarine bricks, dark prismarine, and sea lantern), 2 new mobs (guardians and elder guardians), and 2 new items (prismarine shards, prismarine crystals). You can use these items to craft 3 of the 4 new blocks. Before we get into all of the new crafting opportunities at your disposal, let’s first better understand what this new game “patch” entails. What are Ocean Monuments in Minecraft? 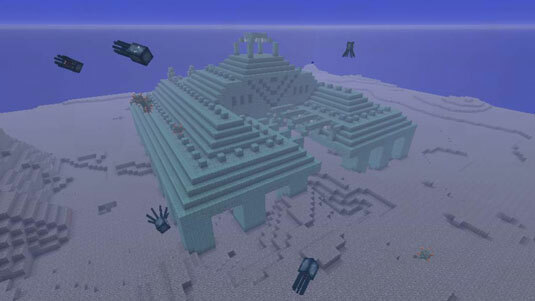 Ocean monuments, also referred to as Water Temples or Guardian Temples are randomly spawned structures found underwater in the Deep Ocean biome. After dodging the numerous squids protecting the outside of the temple, you can enter the ocean monument by following its arches and sea lanterns, which will guide you to an undersized entryway. These buildings are often sought out by Minecraft players because there are treasure chambers included within (where gold blocks can be found and collected), XP to be gained, and prismarine items to be collected. Other useful in-game items such as wet sponges can also be found inside of these temples. Prepare yourself with underwater breathing enchantments and potions. Having a potion of night vision will help you more easily locate ocean monuments. Also, be sure to be prepared for battle as these structures have hostile mobs (guardians and elder-guardians) with powerful laser attacks ready to defend the temple. Find a deep ocean biome and start exploring. If possible, use a boat as it is the easiest and fastest way to locate these temples if in Survival mode. Look for sea lanterns in the ocean as these are more easily identifiable. Use an Ocean Explorer Map, if you have acquired one from the cartographer villager. Now that you know what an ocean monument is, why you might want to set out on adventure to find one, and how to prepare for that journey, we can examine more of the new prismarine materials used to construct these underwater temples. You obtain prismarine shards and crystals by killing guardians and elder guardians. The crystals are rarer than shards because the crystal drops only if raw fish doesn’t drop, but you can also obtain the crystals by breaking sea lanterns. You can farm prismarine shards and crystals by farming guardians, similarly to farming witches (before Version 1.7) or slimes, because they spawn only in ocean monuments. (Witches before Release 1.7 spawned only in witch huts, and slimes spawned only in the Swamp biome and slime chunks, making all three spawn only in limited spaces). Prismarine is one of the two solid blocks that has an animation. The appearance of prismarine is coral-ish because rocks are pressed into it. The color of those rocks is aquamarine. The animated parts are the cracks between the rocks — those cracks turn from blue to green to purple. You can find prismarine blocks in ocean monuments but you can also craft a block of prismarine by placing 4 prismarine shards into a 2-by-2 square. Prismarine bricks are inside ocean monuments. They’re paired with normal prismarine inside the monument, but they have just a slightly different texture. Prismarine bricks use the same color of prismarine and have cracks, but those cracks don’t change color. The texture is a distorted green stone brick. The way to craft this beautiful block is to fill all nine spaces in the crafting grid with prismarine shards. Ah, dark prismarine — the only block you should look for inside ocean monuments. Why, you ask? Because of the treasure it holds, of course. We’re not visiting an ocean monument to claim the monument or collect the blocks. Of course, after you take dark prismarine blocks from an ocean monument, you can also take the treasure — eight glorious gold blocks, sealed behind the dark cyan cubes that make up the dark prismarine block. In addition to taking dark prismarine blocks as you take the prize of an ocean monument, you can also craft these blocks yourself. To make a dark prismarine block in Minecraft, place 8 prismarine shards on the outer slots of the crafting grid, and then place one ink sac in the middle. Glorious sea lanterns bring a new light block into Minecraft — the first solid block to be animated in the game. You can just see the radiance produced by this block. It’s as though a little circle is expanding inside of it. On the edges of this block lies an aquamarine casing, with a light aquamarine inside. Sea lanterns, like jack-o’-lanterns and glowstone, have a light level of 15. To craft a sea lantern in Minecraft, you need 5 prismarine crystals and 4 prismarine shards. Place the 4 shards in the four corners, and place the crystals in the remaining five slots.